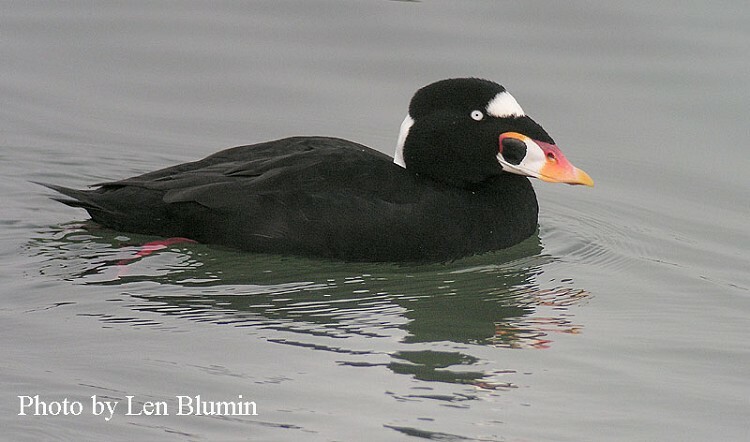 The Surf Scoter is a large, migratory, diving sea duck, primarily found in large single or mixed flocks along North America’s ocean coastlines. The black and white head pattern of the male has given it the nickname “skunk duck”. Description: The male has a large, heavy, multi-colored bill, patterned with orange, black and white that slopes off a square-shaped head that has two distinct white patches. One on the forehead and one on the nape. The female’s bill is greenish-black, sloping and equally large. Females are dusky brown with a dark crown. Her head has two light patches on the sides and a pale whitish patch on the nape. In flight the wings are dark and have no pattern. Surf Scoters fly in straightline formations with rapid, direct strong wing beats. Voice: Generally silent. Male makes a gurgling call during courtship displays. Female’s call is a harsh crow-like call and used when defending her young. Both sexes wings produce a whistling noise in flight. Black Scoter - The male sports all black plumage the black bill is thinner with a yellow-orange knob. Female has dark cap with clean whitish cheeks-not patches. White-winged Scoter – female with similar whitish face patches, but has large white wing patch and sloping forehead. Male has red, white and orange bill with black knob at base and “teardrop” of white near his eye and distinct white wing patch. Habitat: In Tennessee, Surf Scoters can occasionally be found on freshwater lakes. Rarely dives in water that exceeds 30 ft. Status in Tennessee: The Surf Scoter is an uncommon migrant in early spring and late fall, occasionally found in winter in Tennessee.